Hi all, this is my list of the best security resources of the week. This time, as you can see further, my selection is aimed to useful tools and resources to raise the awareness of the users. Here we are with my selection of the best security resources of the week. Hello everybody, this was an important week from a security point of view. Many interesting pieces of news have find their way in the online world. I chose the best ones to present them in this post. 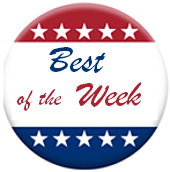 Here we are again with my "Best of the Week" post, so let's see what are the most interesting security resources of this week. Last week I'm travelling back to my home and I wasn't able to publish my usual post so this week I'll post some of the articles of the last week in addition to the new ones.